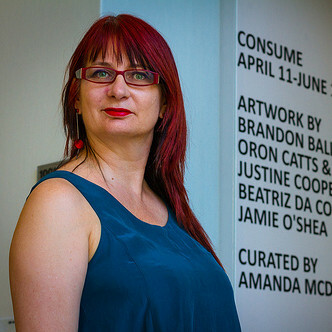 Amanda McDonald Crowley is a New York-based Australian curator and facilitator who has created programs and events of new media art, contemporary art, and transdisciplinary work. She was the Executive Director of Eyebeam Art and Technology Center from late 2005 to 2011. Amanda specializes in creating new media and contemporary art events and programs that encourage cross-disciplinary practice, collaboration and exchange. She moved to New York in October 2005, relocating from her native Australia where she had been based while working nationally and throughout Europe and Asia. Prior to working at Eyebeam, Amanda was executive producer for ISEA2004, the International Symposium for Electronic Arts 2004, held in Tallinn, Estonia and Helsinki, Finland, and on a cruiser ferry in the Baltic sea. Her contributions to the field of electronic art also include her work as Executive Producer of the 2004 edition of ISEA which was held in Tallinn, Estonia and Helsinki, Finland, and on a cruiser ferry in the Baltic Sea. She was also Director of the Australian Network for Art and Technology (ANAT) and later, Associate Director of the Adelaide Festival 2002. She has worked throughout Europe and Asia, holding residencies in Berlin, Germany (1994/5), Banff Centre for the Arts, Canada (2002) and at The Sarai Programme at CSDS in Delhi, India (2002/3). Amanda is also a Board member of NAMAC (National Alliance for Media Art + Culture).